If you love strawberries and enjoyed my Protein-Packed Peanut-Butter Granola recipe, then you are definitely gonna love this one, too! I took that recipe and revamped it to make it a more peanut-centric version (the other recipe includes pumpkin seeds and raw sunflower meats, too and is super-super delightful in its own right). The result is a granola that is sweeter (though naturally so!) yet still incredibly filling, especially when served over plain organic yogurt. The strawberries I used here were, to the best of my knowledge, totally devoid of processed sugar. I had a really hard time locating dried – not freeze-dried, but dried-yet-still-gummy strawberries – that didn’t have processed sugar added to them. But I believe I found them in Steve’s Paleogoods Dried Strawberries. The only ingredients listed on the packaging are strawberries and apple juice concentrate, which I presume is solely made of apples and has no refined sugar added, as no additional breakdown is given of that ingredient as it would be for a typical, hyper-processed food. And let me tell you: these strawberries are DELICIOUS! Like, outta-control good. 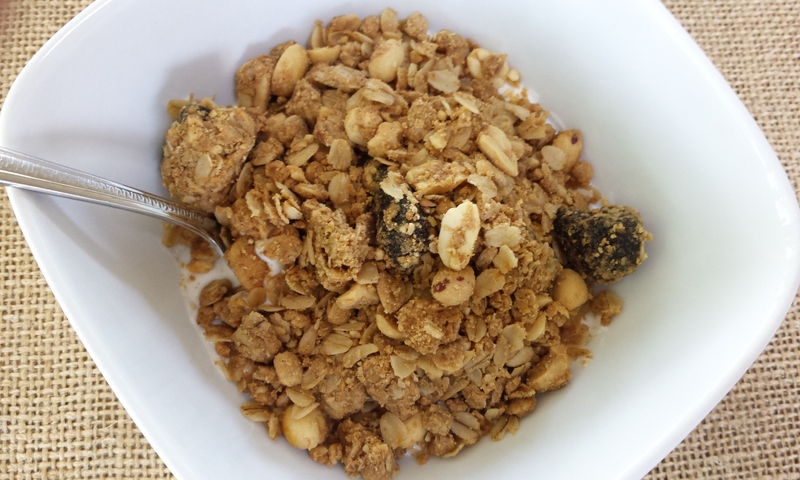 DO NOT open them before making this granola unless you have a really major sense of self-discipline, because if you are anything like me, once you start eating them, you aren’t going to want to stop! These delicious little nuggets of natural sweetness can be purchased via the Steve’s Paleogoods website (www.stevespaleogoods.com) or at health stores that stock them; my local Whole-Foods-esque health-store chain, Better Health, carries them. On to the granola making! Preheat oven to 300 degrees. Grind flaxseed to a fine powder in a coffee/spice grinder. Mix with the oats, chopped peanuts (you can use the spice grinder for this purpose, as well; just pulse a few times for a rough chopping of the nuts), strawberries, sea salt, and cinnamon. To a small saucepan over medium-low heat, add the peanut butter, coconut oil, maple syrup, and vanilla extract. Heat for three minutes, stirring constantly, until a thickened, uniform sauce has developed. Then remove from heat and immediately mix well with the dry ingredients. Spread this granola mixture evenly across a large cooking sheet and bake for 45 minutes, removing it from the oven and stirring it at the 30- and 15-minute marks to ensure even cooking. Once done, remove from the oven and let cool before transferring it to an airtight container, where it should keep well for at least a week. This yum! childhood comfort food is especially delightful, as I previously mentioned, served over plain organic yogurt but also fares well with milk or on its own as an on-the-go snack.